Welcome to the outer limits, astronauts. 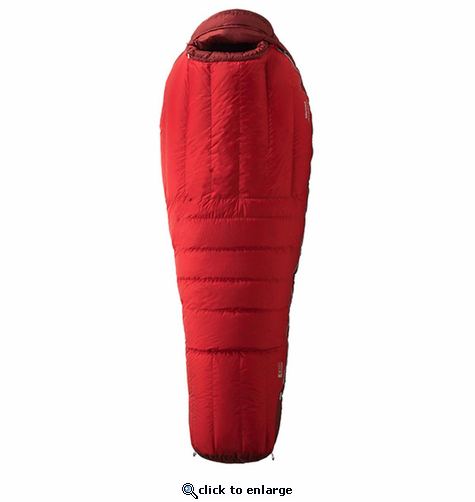 High-quality 800+ fill goose down and MemBrain waterproof, breathable fabric form the core of this portable environment-designed to deliver restful sleep, down to -40\xB0F, in the harshest alpine environments. Over-engineered with sturdy reinforced linings and countless baffles for a lifetime of dependable comfort and protection. In April 1971, University of California Santa Cruz students Eric Reynolds and Dave Huntley were in Alaska's Juneau Icefield on a school Glaciology project. It was there on a glacier that the idea of a Marmot Club began. The name 'Marmot' refers to a group of highly social, large ground squirrels that live in mountainous areas. Throughout that summer and over the next two years, Eric and Dave also began making prototypes of down products in their dorm room. Their first products were a down vest, a sweater and a parka and, later, three down sleeping bags. The warmest bag, the PIKA (now known as the CWM) was rated at -45 degrees F.
In the winter of 1973, Eric did an ascent of the Grand Teton in Wyoming with Tom Boyce of Grand Junction, Colorado. The following spring, Eric and Dave joined Tom in Grand Junction where they rented a 100 year old stone building near downtown and opened a rental and retail shop under the name of Marmot Mountain Works. They taught cross-country skiing in the winter to get by. Thus, in the spring of 1974, Marmot the company was born. That fall, Tom was climbing in Peru where he met famed adventure filmmaker Mike Hoover. A few weeks after his return, Tom received a call from Mike. He was calling on behalf of 20th Century Fox who were filming a movie called The Eiger Sanction with Clint Eastwood, and needed 108 very puffy jackets. "No problem", said Tom, "we were working on that when you called." Well, they weren't, but they then did. Within a week, the Marmots had designed the Golden Mantle (very puffy jacket). Marmot was now in the movies. It also had its biggest order to date. In 1976, another meeting would change the future of Marmot when Eric met Joe Tanner of W.L. Gore & Associates. Eric was one of the first in the U.S. to see a new concept in outdoor performance fabrication called Gore-Tex. He was intrigued, and within a couple weeks had sewn prototype sleeping bags using the new Gore-Tex fabric for field testing. He and Dave proceeded to spend seven nights in a commercial frozen meat locker comparing bags with and without the Gore-Tex fabric as well as testing the bags under fire sprinklers. They liked what they saw and immediately changed everything in the line to Gore-Tex fabrications. Today, Marmot is the oldest customer of W.L. Gore in the world outdoor market. Marmot has grown quite a bit since our humble beginnings in 1974, but one thing has never changed; our commitment to designing the highest quality performance product. In 2014 we look forward to celebrating our 40th Anniversary with you, our dedicated fellow Marmots.